Performers include: Fred MacMurray, Stanley Livingston, Don Grady, William Demarest, Barry Livingston, Tim Considine, William Frawley, Tina Cole, Beverly Garland, Dawn Lyn, Ronne Troup, Ricky Allen, Daniel Todd, Michael Todd, Joseph Todd, Meredith MacRae, John Gallaudet, Cynthia Pepper, Joan Tompkins, Eleanor Audley, Joan Vohs, and Doris Singleton. Aeronautical engineer Steve Douglas (Fred MacMurray) has his hands full. After the death of his wife, he’s left to raise his three young sons in the Midwestern town of Bryant Park. As the series begins, Mike (Tim Considine) is 18, Robbie (Don Grady) is 14, and Richard, otherwise known as “Chip” (Stanley Livingston), is seven years old. Thankfully Steve’s father-in-law, Michael Francis “Bub” O’Casey (William Frawley), lives with the Douglas clan and keeps the house in line. After several years, “Bub” returns to Ireland and his younger brother, “Uncle Charley” (William Demarest), steps in to fill the void. Around the same time, Mike meets and marries Sally Ann Morrison (Meredith MacRae). They soon move away to California (and are never heard from or mentioned again). Weren't they the same guy? Chip’s young friend, Ernie Thompson (played by Livingston’s real-life brother Barry), was the foster child of some neighbors. When the foster parents are transferred to the Orient, Steve agrees to adopt Ernie and there are three sons in the house once again. The family later moves to Los Angeles and Robbie meets and marries college classmate Katie Miller (Tina Cole). They later have triplets together, Robert, Steven, and Charles (Michael, Daniel and Joseph Todd). Robbie eventually leaves to work in the Peace Corp but Katie and the boys remain in Southern California. Steve eventually remarries to a widowed teacher named Barbara Harper (Beverly Garland) who has a five-year-old daughter, Dorothy or “Dodie” (Dawn Lyn). Meanwhile, Chip falls in love with Polly Williams (Ronnie Troup) and the teen lovers elope together. They live in a nearby apartment and visit frequently to help keep the ever-changing Douglas household interesting. Episode 380 – Whatever Happened to Ernie? Steve’s boss Bob Anderson (guest John Gallaudet) and his wife Sylvia (guest Irene Hervey) come to the Douglas family for help. They suspect that their son Gordon (guest Russell Schulman), one of Ernie’s classmates, is taking drugs. First aired: April 13, 1972. Surviving castmembers MacMurray, Considine, Grady, Stanley and Barry Livingston, MacRae, Cole, Troup, Garland, and Tramp the dog reunited for a November 25, 1977 special called A Thanksgiving Reunion with The Partridge Family and My Three Sons. Demarest appeared via a pre-recorded message and talked about Frawley. Castmembers of The Partridge Family also took part in their own reunion on the show. • MacMurray was a big movie star when the series began and was hesitant about committing to the long schedule of a television series. As a result, his contract stipulated that he only work for 65 days per year. He’d begin working with the cast in May and continue for 35 days. He’d leave for 10 weeks and then return for another 30 days of production, wrapping around Thanksgiving. The cast and crew would film all of MacMurray’s scenes during these times and then fill in the rest while he was away. This became particularly problematic when the boys went through growth spurts or a guest star was involved and had to be called back months later to complete an episode. • At the end of season five, Considine wanted to direct episodes and cut back on his acting. He had a falling out with Executive Producer Don Fedderson over the issue and chose not to return continue with the series. Mike was seen in the first episode of season six and was never heard from again. • Frawley wasn’t in the best of health and in 1965 was no longer insurable by the studio. Because of the show’s unusual shooting schedule, if Frawley had become ill or died during the season’s production, the cast and crew would have to do a lot of reshooting to complete the episodes. Uncle Bub was written out of the show and replaced, much to the dismay of Frawley and the other castmembers. Frawley died in March 1966. • The show began in black and white on ABC. The studio wanted to change the show to color for the 1965-66 season but ABC didn’t want to pay the extra expense. As a result, the show moved to CBS. It aired on the Tiffany network for seven years, in color. 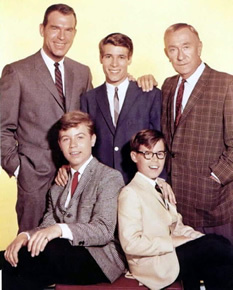 • On January 6, 1972 (during the show’s final season), CBS broadcast A Special Hour With My Three Sons. It revolves around Steve hitting his head and developing partial amnesia. The other characters try to jog his memory by talking about past events (illustrated via clips). The special was never shown again, is not included in syndication packages, and is not included in the episode count for the series. My Three Sons: Tune In to a Live Cast Reunion — Today! Such a great show. Great that MeTV is airing it. To bad they couldn’t have had a series finale as I am sure the network, writers, cast knew it was over. Were the ratings that bad the final season? While Charley was the boys’ great uncle, Bub was their grandfather, not “Uncle Bub.” Also during the show’s final season Chip was practically never seen and Robbie was totally absent yet the actors’ names were still listed in the opening and closing credits. when i was stationed at fort huachuca arizona in june 68 i think chip was also there. anyone else know for sure?? denny wiederien » I don’t think so. He was still making the show in 1968. What a great show. The kids today should see this kind of show! Why not take off the stuff (?) that’s on “Nick at Nite” and put a good show like this on! yes is there a way I can get a copy of DVD on ” A specail hours with My three Sons”, which ran on CBS and ABC in the 1960’s and early 1970″s. @kevin wriedt: Not that I know of. It’s not commercially available. THIS WAS A GREAT SHOW.IT IS TOO BAD THAT BUB WAS WRITTEN OUT OF THE SHOW. YOU ARE SO RIGHT. WILLIAM FRAWLEY COLLAPSED IN THE STREET AND DIED IN 1966. All three the tripletts joined the US Army and I was stationed with Joseph Todd while at West Point New York. He was a medic.